Map of South Edan for Elex. Missions, NPCs, Quests, Teleporters, Trainers, Traders, Monsters, Items, Secrets, Hints, Locations ELEX Walkthrough, ELEX Maps, ELEX Guide & Wiki. 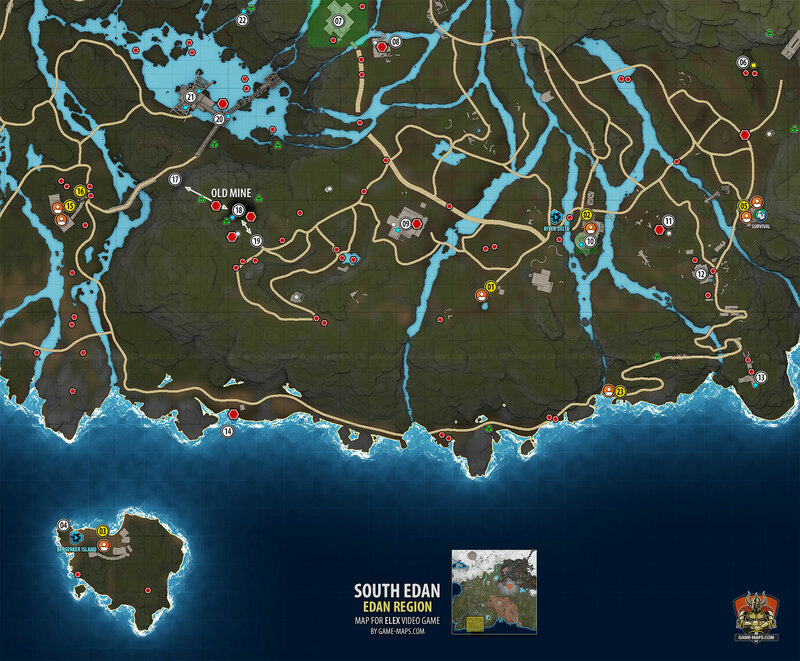 South Edan Map for Elex. Irdor has run out of provisions. He is in desperate need of food for him and his men. Sinda in Goliet normally organizes her deliveries. You need 50 Cultivator's Loafs. You should have some Cultivator's Loafs with you. Go to Sinda in Goliet (11), she cant hepl you. You can buy rest from her and at the tavern. After you finish [Supplies for the Cultivators] return to Ragnar in Goliet for additional reward. I found Kral. Now I just have to figure out why he stole the Elex. Or just take it from him and return to Caldrim. Kral stole the Elex from the Mana Shrine to keep his brother Grimar alive. I could take the Elex or leave it with him. Chunks of Elex. They're worth a lot, but what should I do with them? Kral and Grimar are dead. Katta says that she was exiled unfairly. She wants me to find a way to prove her innocence So she can return to Goliet. Katta told me that Alrik is her last remaining friend in Goliet. If someone can help her, then it's him. For some time now there have been a few creatures lurking around Geron's camp. He is anxious and wants them to be taken care of. Lennart wants his bow back. He lost it while hunting. It is difficult to survive in the Wilderness without a suitable Weapon. 09 House - They are hostile. There are some Elexit and other stuff in cellar, but no quest items. "In the toxic seller at location #10, there's a golden whisper." Raptors are for [Waiting] - they are a serious threat. Egil is scared of the creatures around the camp here. He Wants them dead. Kill 5 Weakened Rotboars. Galar, an exiled Berserker at the logging camp, is hearing strange sounds at night. He is afraid that supernatural forces are sneaking into the camp at night. Galar asked me to clear the old mine of reavers. Reaver will come, you have to kill him. Things are being stolen from Galar's camp at night. He is afraid it is the spirits of the forest and is too scared to go out into the surrounding woods. I will have to wait until late in the night if I am to discover who, or what is behind this. Mine is populated by Reavers. There are about dozen of them there. There are several ore veins here. Gore Reaperblade I - weapon, up the tower. "Gondars key is directly beside his corpse"
Gondar's Chest I can not find a way to open it.